The thoracic spine is often a neglected section of twelve vertebrae stuck between the much more talked about lumbar spine and the forever-painful cervical spine. 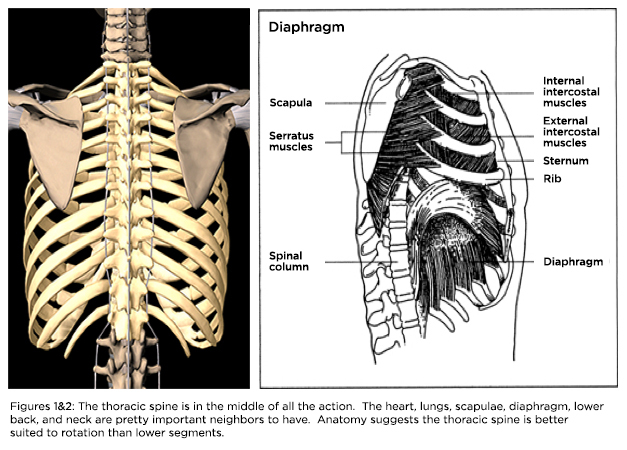 By definition, the thoracic spine is the twelve vertebrae that connect with the rib cage and is located between the lumbar spine and the cervical spine. Because we rarely get thoracic pain we tend to overlook this critical area. Neck and low back pain are rampant so the thoracic spine is often completely overlooked. Unfortunately a big key to avoiding both lower back pain and neck pain may lie in the mobility of your thoracic spine. In the simplest terms, the body does what is easy, not what is best. As we age the thoracic spine stiffens. As a result we tend to turn the head at the neck (cervical spine) or rotate at the lower back (lumbar spine). A mobile thoracic spine can help to avoid or relieve both low back and neck pain by allowing rotation in this key area. In the simplest terms, the body does what is easy, not what is best. For years we have been warming up the wrong area with the wrong exercises. Lots of “experts” recommended exercises like hip crossovers and scorpions to “warm-up” the low back. Here's a video I put together for Golf Digest discussing common "rotational" exercises that are probably doing more harm than good. "The overall range of lumbar rotation is ...approx 13 degrees. The rotation between each segment from T10 to L5 is 2 degrees. The greatest rotational range is between L5 and S1, which is 5 degrees…The thoracic spine, not the lumbar spine should be the site of greatest amount of rotation of the trunk… when an individual practices rotational exercises, he or she should be instructed to "think about the motion occurring in the area of the chest"
Therefore, a way to get good hip motion and good shoulder turn is to focus on the hips and thoracic spine, not the low back. Bottom line, bad golfers turn at the low back. Good golfers turn at the hips and shoulders. Additionally, the ability to resist or to prevent rotation may in fact be more important than the ability to create it. Clients or athletes must be able to prevent rotation before we should allow them to produce it. As I mentioned in the video above, golfers should seek to improve internal and external rotation of the hips. Exercises like the Comerford Hip Complex, a progression developed by Australian physio Mark Comerford, strengthens the rotators of the hips and improves lateral stability in your golf swing. Place the tennis balls under your back with one ball on either side of the spine. Begin at just above bellybutton level. With the balls in position do five crunches. You should feel the balls pushing into your spinal erectors (the big muscles on either side of the spine). The balls are actually pushing the vertebrae slightly forward, in effect creating motion (mobility) at the level of that segment. A series of these crunches can be done all the way to the top of the shoulder blades. The end result is often a large increase in shoulder turn. Another possibility is to foam roll the thoracic spine. Make sure the elbows are together to separate the shoulder blades and get pressure on the thoracic spine. If you are bothered by low back pain, neck pain or want more shoulder turn try the attached mobility exercises. Just remember, it’s not always where it hurts that needs the attention. Often times it’s the joint above or below. Coach Boyle, Thank you for your knowledge and wisdom you so freely share on the internet, here and elsewhere. Based on your teaching, I am much more careful in choosing which exercises I incorporate in my workouts. I do have a question concerning some of the stretches you have eliminated: there is a very popular stretch endorsed here and elsewhere, even Gray Cook has endorsed it with his personal touches added. The stretch is called the Brettzel, and is presented as a Thoracic Spine Mobility exercise. Looking at your video of stretches you no longer recommend, can you, or someone else, tell me if it is too similar to the Lying Trunk Rotation you feel should be avoided? I am looking for the right Thoracic Spine exercises to improve my golf swing. Thank you. Excellent exercises! I use the tennis balls almost every day for myself and with clients. Most find it very difficult in the beginning, but grow to love the exercise as it produces results! I still remember hearing Mike speak years ago. Plus he was a pleasure to meet. Love his demos. He makes total sense. I will use the thoracic stretch in about 45 minutes with a golfing client. Thanks! Mike knows what is best. always protect danger zones and make a movement happen where needed! Makes a tonne of sense. Loved the bit on stretches to avoid. I'll take that to my clients. 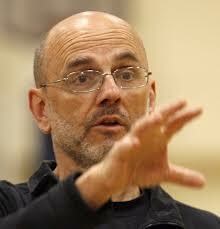 Mike Boyle tells the truth! Very well done , no BS just the facts.